All parishioners, participants and businesses are encouraged to place an AD in this year’s Journal. 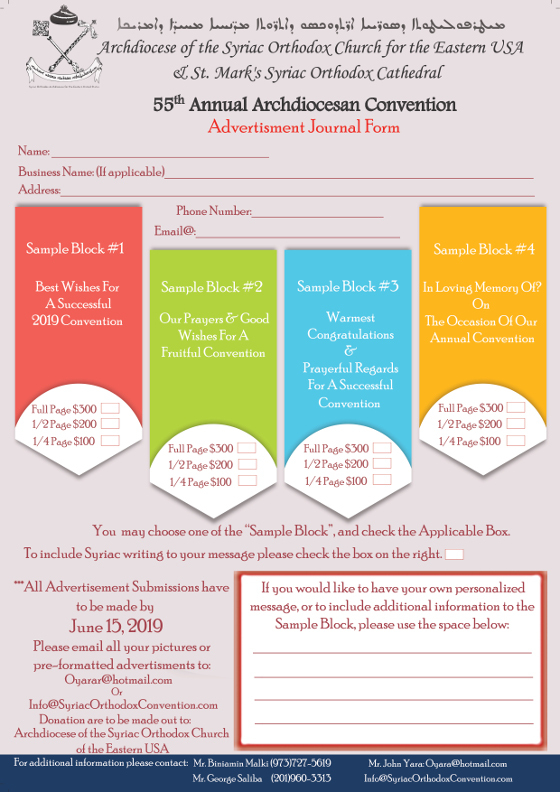 The Journal, which is printed in color, is distributed to all Convention participants as a memorable booklet. Your contribution to the Journal is tax deductible and is critical to our success. We urge you to advertise your business to gain maximum exposure within the community. Doing so will also help defray some of the administrative expenses associated with the convention. Please Download the Ad Selection Form, select your your message and page option and send the material the contacts and emails below. Please make payment payable to: Archdiocese of the Syriac Orthodox Church of the Eastern USA and reference AD BOOK on memo line.